Y’all know I love dairy and meat, right? But that doesn’t mean I don’t enjoy food devoid of any animal products. I actually cook mostly vegan for myself at home, as a way to counteract richness-laden wine dinners (cry me a river, I know!) and late night pizza and burritos. You may recall my last vegan cooking adventure, which involved putting green bean casserole on a pizza and pairing it with a duo of dry Rieslings. But this time out I went from savory to sweet. 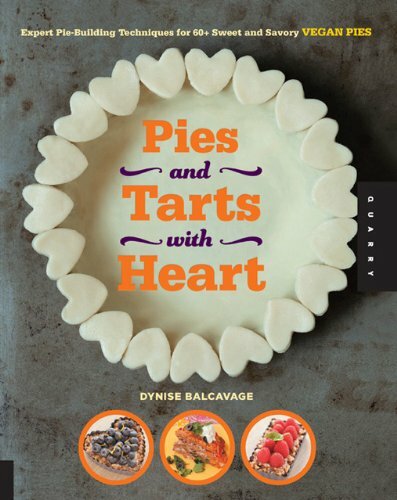 I received a free copy of Pies and Tarts with Heart by Dynise Balcavage and went to work (again) with Helen from Vegtastic. (And please read Helen’s pie post!) Dynise, by the way, is the creator of the Urban Vegan blog. I like the tag line for her blog: good food is good food. But what to cook from this book? Helen and I honed in on the recipe for the Surprisingly Sweet Parsnip Pie. Parsnips? Pie? Sweet? We were intrigued. I picked up some parsnips from the great folks at Local Roots Farm who have a must-frequent booth at the Broadway Farmers Market in my Capitol Hill, Seattle neighborhood. When do they turn into pie? I peeled, boiled, and mashed the parsnips and brought them over to Helen’s. And then, frankly, she did the rest. Though I did read aloud the ingredients and measurements needed to make the filling while she added them to the blender. And, because I am quite the multi-tasker, I also concurrently drank a beer. Holy smokes, can I tell you how delicious this pie was?!? The parsnips gave it a savory edge and a distinct root vegetable note. And what I really appreciated is that the pie wasn’t too sweet. No cloying, candy-like pumpkin pie here. It also makes an awesome breakfast. If you have any leftover (make two!) the next day, I highly recommend pairing it with your morning coffee. Oh, and there were no apples in the recipe, I just thought the photo could use a little color. It’s not the sexiest looking pie, and would probably benefit from some whipped topping (suggested in the book) or, as Helen and I thought, a cranberry compote. That would give it some sizzle. Though, in the flavor department, this parsnip pie is Scarlett Johansson-hot. But though devoid of apple, this pie did get me thinking about our state fruit when it comes to a wine pairing. Since the pie is not a sugar bomb, I think a dessert wine with similar properties is in order. 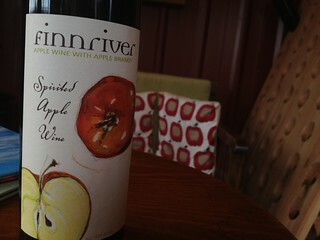 I’d check out my old friend, Finnriver Spirited Apple Wine. 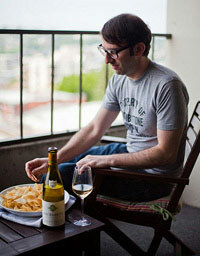 (And, hey, you can even check out my tasting note there.) It kept me warm on many a chilly January night on the farm. (Read all about it.) I can’t think of a better way to end a meal than with a slice of parsnip pie and a slightly chilled class of of this blend of apple wine and apple brandy. Let’s get to the root of the matter—groan!—root veggies are not just for savory foods. Although we are comfortable using orange vegetables like carrots and sweet potatoes in desserts, other tubers also make wonderful, sweet bases. 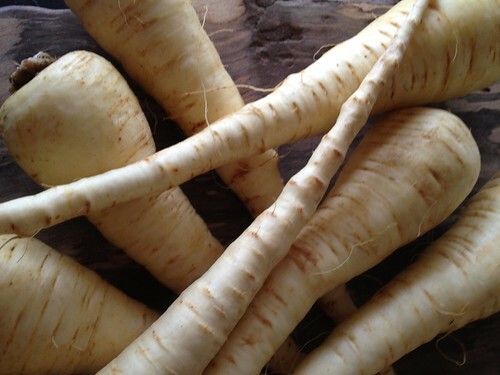 The parsnip is inherently sweet with an undertone of heat that reminds me of ginger. Try this unconventional autumnal pie. You will be pleasantly surprised, especially if you’re already a parsnip fan. Use gluten-free gingersnaps for a gluten-free pie. Prepare the cookie crust and press into a pan. Refrigerate until the filling is ready. Boil the parsnips until soft, about 15 minutes. Place in a large bowl and mash until creamy. Blend the remaining ingredients in a food processor or in a blender until well incorporated, then add the parsnips and process until smooth-ish and well combined. You’ll need to scrape down the processor every now and then. Pour the filling into the crust, leaving 1/4 inch (6 mm) of space to the crust edge. Bake for 15 minutes, then lower the heat to 350°F (180°C, or gas mark 4) and bake for 30 to 35 minutes, until the pie top is golden. Refrigerate for at least 4 hours before slicing. Got leftover filling? Pour into ramekin dishes and bake at 350°F (180°C, or gas mark 4) for about 15 to 20 minutes, or until firm. Whiz the cookies/crackers and salt together in a food processor until very powdery and fine. Add the margarine and whiz again. Press into your pie pan. That’s it! If you need to prebake, bake for 10 minutes at 350ºF (180ºC, or gas mark 4). 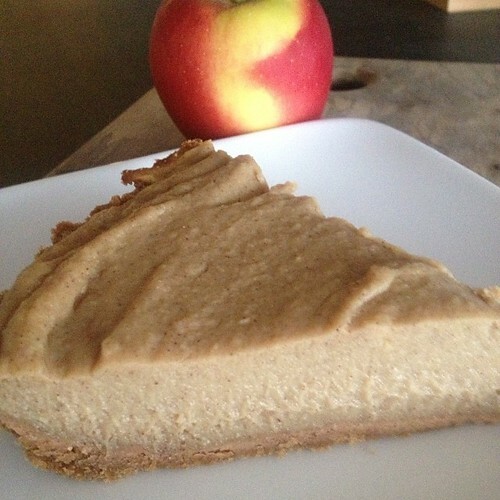 Your recipe for sweet parsnip pie looks very decent and tasty and great for me as I’m vegan! Cook quick and easy dinner recipes fast and learn them very easily. It’s a fantastic pie for dessert or breakfast. Recipe is from Pies and Tarts with Heart; check it out!